What Is This Typescript Thing? In this guide, we'll build a Giphy search application to learn Angular 2's basics and some advanced skills. So, you've skimmed a few lines of this new shiny Angular 2.0 and you were left thinking, "Huh?" Trust me; I share your pain. When I first looked at it, I thought I was losing my grip. I was pretty comfortable with how Angular 1 did things and this seemed so different. However, now a converted man, I'll tell you the same thing you've probably heard before: Angular 2.0 is much better than its predecessor. Adjusting to a new technology is difficult, but it may prove necessary. Plus, once you become familiar with Angular 2, you won't remember why you didn't like it in the beginning. There is a fast, easy method of migrating apps from Angular 1s. If you want to get into the details of how to migrate apps to Angular 2, start here. As I said in the Introduction paragraph, we're going to build an application for searching (and showing) gifs from the Giphy website by using their API. In the end, we'll also deploy our app to Github pages. You can try the app here and you can fork the complete source code on Github. Setting up an Angular 2 application from the ground up can actually be a lot of work, in terms of installing and configuring settings. Folks at Ember had one great advantage: a tool called ember-cli. This tool bootstraps the application and helps with some common project operations and scaffolding. Sure, we previously had Yeoman and its Angular generators, but they did not become widely-known conventions and they definitely weren't defacto tools like Ember. Create a scaffolded app with proper directory structure and included tests, with one simple command (ng new). Generate components, routes, services, and pipes. The CLI will also create simple test shells for all of these. Put your application in production (ng serve) easily. Deploy the app via GitHub Pages (ng github-pages:deploy). Run unit tests or end-to-end tests. Execute the official Angular2 linter (ng lint). You'll know that the installation went well because you'll get a bunch of output and help on various angular CLI commands. Just for reference (in case you follow this guide at a later stage and something is not the same as I output it here), my version (ng --version) as of this writing is angular-cli: 1.0.0-beta.9. Your browser should show you the string app works! when you visit the app on the link: http://localhost:4200/. In case you're curious about the 'Could not start watchman' output above. You can learn more about it here. In short, the article explains using brew install watchman if you're on Mac. 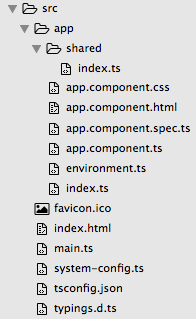 Now, you might be wondering, what are all these .ts files? These are TypeScript files and, even though you don't need to use TypeScript with Angular 2, almost everyone does. 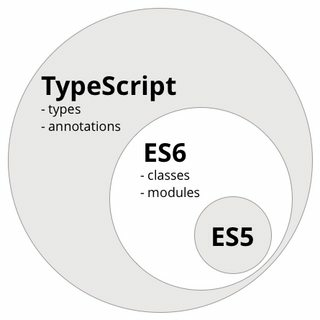 From this, we can see that this TypeScript contains ES6 (EcmaScript6), which then again contains ES5 (EcmaScript5), which yet again means that TypeScript contains ES5. I won't go into details here; you can learn about each of the above features by clicking on the links. However, let's take a look at a few things to get you started. Notice that we defined the type of our variable using : string. This is new. Then, you can write any TypeScript code, save it in a file, run it through the TypeScript compiler, and finally run the output of the TypeScript compiler with Node. As an output, you should get I like to repeat what you said, therefore: hello. In this guide, you learned how to get started with using Angular 2 and the components needed to create an application for searching Giphy's gifs by using their API. In the following guide, Building a Giphy Search Application in Angular 2 we'll go into more detail about building our application in Angular 2.